Cozumel  is a Caribbean island just off the Yucatan Peninsula in southeastern Mexico. It has great beaches, nice people, and safe streets, with prices comparable to other Mexican tourist destinations. It was badly battered in 2005 by Hurricane Wilma, but, with few exceptions, has been completely repaired. Downtown San Miguel - the only city on the island of Cozumel. Cozumel has an international airport (Airport Code: CZM) which receives direct flights from Atlanta, Charlotte, Chicago, Dallas, Denver, Detroit, Halifax, Houston, Miami, Minneapolis, Montreal, and Toronto as well regional flights from Mexico City. However, most of the travelers fly into Cancun (Airport Code: CUN) which generally has more flights, then take a bus or van south to Playa del Carmen and take the ferry across to Cozumel. A shared van from Cancun airport to Playa Del Carmen will cost around 300 pesos per person one-way, where a bus will be around 130 pesos (or $12 USD if you do not have pesos handy) per person one-way. Also you can take a small plane to Cozumel from Cancun airport's domestic terminal. It takes just 15 minutes and the trip is an amazing experience for about $75 USD per person one way. There are nearly hourly rides to and from Playa del Carmen and it will take you about 35-40min on the ferry. There are two companies in service. They are called Ultramar and Mexico Waterjets. As of Nov 2017 Ultramar was 150 pesos per person one direction and Mexico Waterjets was as low as 45 pesos. Mexico waterjets depart from Playa del Carmen to Cozumel every full hour at 9, 10, 11, 12, 13, 17, 18, 19, 21 o'clock. To get from Cozumel to Playa del Carmen you can go at 07:30 and at the full hour at 9, 10, 11, 12, 16, 17, 18 and 20 o'clock. There are two companies, so buy a single ticket because you may need to use the other ferry company coming back and the tickets aren't transferable (two one-way tickets cost the same as a return anyhow). 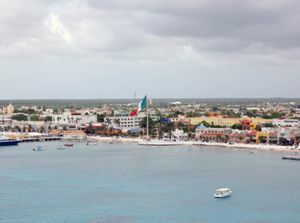 A car ferry leaves from Calica, a few kilometers south of Playa del Carmen (pass Xcaret). The car ferry from Puerto Morelos no longer exists! There are 4 ferries each day, but the first at 04:00 AM and the second at 08:00 AM are specially for supply and logistics of the locals and islander. So take the ferry at 12:15 PM and 06:00 PM. From Cozumel back to the mainland you can take all ferries: 06:00 AM, 10:00 AM, 04:00 PM and 08:00 PM. As of October 31 2015, rental cars are allowed and cost 400 pesos for the car and driver. You purchase your tickets in the wait line at the dock. Recommend you get in line at least one hours before the scheduled departure time. But parking in Cozumel city is a nightmare and you will be ticketed and they will remove your rear license plate that can only be retrieved at the policia station on Quintana Roo Ave about 300 feet beyond the intersection with Ave Rafael E melgar (the main road that runs along the waterfront) at a cost of 300 pesos if you pay within 24 hours,600 pesos after 24 hours. Cruise ships often visit the island. A few can dock virtually downtown. A larger pair of piers lies about two miles south of downtown San Miguel, and primarily serves Carnival and Royal Caribbean Cruise Line ships. If many ships arrive the same day (occasionally in "high season"), some may moor offshore and tender passengers to docks virtually downtown. Walk, rent a car, or take a taxi; there is no public traffic out of town. The docks are saturated by pushy agencies trying to lure you into car rentals and activities. The younger travelers or anyone who has free time may want to take them up on their offer. Always check first so you are not getting scammed but it is usually just a timeshare offer. You pay about $20 for a jeep rental or a moped for the entire day and you get free breakfast at a five star resort. A regular day car rental is around $55, but speaking Spanish will get you a discount 95% of the places if you ask. For example, the posted price for a VW Pointer at Less-Pay (next to Hotel Barracuda) was $40, without insurance and taxes. As an American who speaks Spanish, you can get that same car for 350 pesos, with insurance and taxes. Even if prices are posted, they can be bargained. Scooters half that (~25 dollars). Be aware that the rental insurance usually does not include thievery - if any part of the rented vehicle will get stolen you will have to pay for it from your own pocket. There are options of additional insurance options though, paid on top of the rental price. Alternatively, taxis are always available and will take you to the west-shore beaches for $20 onwards, depending on distance and number of people. Taxis cost between $2 and $3 (30 to 60 pesos) for intra-town destinations. Like the rest of Cozumel, they accept US Dollars at the current exchange rate. Bicycle rentals are also available. The Cozumel rent-a-bike offers several different types of bicycles. The rates vary depending on how many days you want to rent the bicycle. One day is 20 USD. Two or three days is 15 dollars a day. 4 or more days is 15 dollars a day. Some inexperienced riders expect that if they can drive a car, then they can drive a scooter. Some riders are unfamiliar with driving practices and conditions in Mexico. Roads are not always in the best condition, and potholes are generally unmarked. Scooters offer substantially less protection from accidents than anything with four wheels. Many accidents are also caused by tourists having too many alcoholic drinks and then driving "motos." Scooters can be a great way to explore the island, but should only be driven by experienced riders. If you are not experienced, please do not rent them. Cars and Jeeps are available for rent at multiple locations, including airport and cruise terminals. At Cruise terminals, one day rental costs roughly between US$45-$80 for most of models without insurance. The paved road is in very good condition from mid-part of the island to the southernmost part. Jeep would be a better choice if you plan to drive on unpaved road in some parks. The cars tend to be with relatively higher mileages comparing to those in US and Europe). Wide spread scams at all three PEMEX gas stations on Cozumel island have been frequently reported for many years by tourists online. Some scams may occur even with tourist watching. PEMEX stations are individually owned and operated. So, each gas station has its own office handling complaints. Some car rental agencies at cruise terminals offer $25 flat fuel charge without refill at the time of return. Use credit card, rather than cash, to pay for the gasoline may offer potential chance for charge dispute and settlement later. Carretera costera sur km4 (Right Across from Park Royal hotel), ☎ (52) 98787-112233 ([email protected]), . 08:00 AM - 06:00 PM. Scooter and Jeep rentals. Scooters 15/20 USD for 12/24h; Jeep Wranglers for 45 USD for 24h, unlimited milage and liability insurance included. Most visitors travel to Cozumel to dive and see its wonderful underwater life. While there are quite a few beach clubs that offer snorkeling, the main attractions are the reefs offshore and the multiple dive shops and operations are always ready to take you there. The main town, San Miguel, and dive operations are on the west side of the island, but if you rent a car or scooter then the east side of the island is the place to go. The east side of the island is mostly undeveloped, but there are beautiful beaches, big waves, and rocky outcrops over the ocean. If the waves are sufficient you can find a few small blow holes. (Be aware that the waves and attendant undertows can make swimming on the east side very dangerous, however.) You will also find a restaurant on the beach every few kilometers. Cozumel also offers several Mayan archaeological sites. The most extensive vestiges are those at "San Gervasio" (admission fee is 77 pesos), an inland site a few miles north of the "Carretera Transversal" highway. Another site is located near the village of El Cedral, inland from the "Carretera Costera Sur" highway. In Punta Sur Park, at the southern tip of the island, there is the "El Caracol" temple, believed to have been used as a lighthouse by the Mayans. 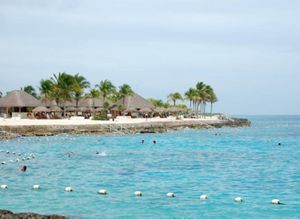 Cozumel is one of the premier scuba diving destinations in the western hemisphere. The island abounds with dive shops, most willing to give you a scuba class (resort course) and take you out if you are not yet certified. A boat dive for certified divers (two tanks) will cost around $90, plus any equipment rental (note that all Cozumel dive shops include only tank and weight belt in their prices so expect to pay another $20-25 for BCD, reg, mask, fins and wetsuit) and Marine Park Fee. Most dive sites are located well south of the city proper, as are a number of dive shops if you want a short boat ride. Most diving in Cozumel is drift diving, where you are dropped off by the boat at the beginning of the dive, are carried along the reef by the current, and picked up at the end of your dive by the boat. There is some shore diving, but it is limited compared with what you can enjoy further out and places like Palancar Reef and the walls. Along with other marine life Divers are able to see Seahorses and Eagle Rays and Turtles, especially during Turtle Nesting season, sees large numbers of Turtles on Cozumel's beaches during nesting seasons. Aldora Divers  — training, certification and fast 6 person boats with high capacity steel tanks and long surface intervals, usually at Palancar Beach Club. Rental equipment. Night Dives. Nitrox available. Villa Aldora room and suite rentals. Always Diving  — Diving lessons and professional certified dive instructors in the best dive spots in Cancun, Cenote dives, Cozumel dives. Phone: +52 (998) 849 57 10 Toll Free: +1.786.245.7849 Hours: 8:00 am to 4:00 pm, 365 days a year. Aqua Safari  — training, certification and two types of daily dive trips (fast or large boat). Good company but they tend to pack more people on a dive trip (up to 16 on the big boats). When the wind is blowing and the small boats cannot go out, their seaworthy boats often still can provide service. They also have a 8 person fast boat available. 1 tank afternoon dives are a very good deal. Night dives Tuesday, Thursday, Saturday. Nitrox Available. Hotel packages with Safari Inn, Cozumel Palace and several other hotels. Blue XT~Sea Diving  — training, certification, equipment rental, and nitrox are available from this dive op. Personalized service, max 6 divers per fast boat. They'll keep and clean your dive gear (except wetsuit) if you wish and have it on the boat the next morning. Night and Afternoon dives based on demand, and hotel packages with decent savings are offered. Bottom Time Divers  — training, certification and 6 pack diver fast boat are available from this very popular family run dive op. Owner/instructor with excellent local knowledge, beach SI's and dive gear overnight wash and rinse etc. Private groups accepted. Buena Ventura Diving,  is a small, personable dive outfit dedicated to the specialized needs of its diving clients. Cozumel Dive School,  — [email protected] A full service, five star PADI dive resort offering recreational and professional certifications, divemaster internships, specialty courses, TecRec courses, multiple daily boat dives, private shuttle to/from the harbor, equipment and accommodations included. Courteous and friendly multilingual staff and students from all over the world offer the opportunity to meet a diverse group of like-minded divers looking to learn, gain experience, pursue the professional realm, and have a great time doing it in one of the World’s Top Dive Destinations! Deep Blue  — training, certification, nitrox, technical and known for fast boats. At most 8 divers with 2 divemaster or as few as 4 divers with 1 dive master. Rental equipment. Night Dives. Hotel and dive package is available through numerous hotels. Dive shop is located in town across the street from La Choza. Divers are usually called the day before diving to arrange dive location and possible divemaster. Dive Paradise  — training, certification and two types of daily dive trips (fast or slow boat). Night dives. Numerous dive / hotel packages. Several dive shops. Rental equipment. In Cozumel since 1984. Find & Dive  — is an online tool for planning and booking your next dive trip to Cozumel. Living Underwater  — small, personalized service offering steel 120s (super-long dives). Best for advanced divers. Mestizo Divers  — Small groups of divers on a modern fast boat. Custom trips to the dive sites of your choice. When not diving they also offer fishing charters. Salty Endeavors  is a boutique dive center featuring personalized service, small groups, fast boats, and highly experienced staff. We are a PADI and SSI Dive Center and carry a full line of rental equipment. Scuba classes start daily and certified divers can enjoy upt o 5 dives daily in the Cozumel Marine Park. Sand to Sea Adventures  — US Cell 612-636-5432 AM or PM Departures, Most often has small groups with personalized dives to fit your needs. Snorkel charters, Fishing charters and SCUBA GROUPS with special large (10+) group pricing. Pickup from many hotel piers and arrangements for cruise ship passengers. Discover Scuba, SCUBA refresher, PADI certification, equipment rental, nitrox rental (EAN Cert Required) and night dives. ScubaLuis.com  — PADI certified Instructors and 2nd Generation Cozumel Divemaster. PADI scuba certification, Discover Scuba and private dive trips available, too. Small boats (maximum of 6 divers), concierge diving and overnight gear handling! Contact me at mailto:[email protected] or call +52 (987) 564-3335. Scuba Mau  — Training, Discover Scuba, Hotel/Dive packages, Dive trips. Utilizes small boats (six people) with a well-trained but personality-filled dive staff. Located next to the Villablanca Hotel. $60 per day for two tanks, $10 per day for full equipment rental. Snorkeling — logically enough, the second most popular activity after diving. Many beach-side dive shops rent equipment for $7-10. Even though all beaches in Mexico are public some require fees to enter and use the facilities. Beaches with a rocky limestone shoreline on the west coast are the best for snorkeling or shore dives since less sand is disturbed so visibility and coral growth are better. Catamaran Sail and Snorkel Excursion — a great excursion operated by Cozumel Water Sports taking you snorkeling to 2 reefs with music, open bar, snacks of fresh fruit and guacamole, 2 daily departures. Glass Bottom Boat Tour — a twist to snorkeling. You visit about two or three reefs, which are small parts of the second largest coral reef in the world. It costs at the most about $40 a couple but you can get it a little cheaper depending on where you buy your tickets. While heading to the snorkeling sites you have the privilege of looking through the glass bottom of the boat to see all the sea-life you pass on your way. Very fun to do as a couple or a family. Mini Submarine Tour — a new way of exploring the underwater world. This new activity by Cozumel Water Sports offers all non divers and non snorkelers to explore the reefs and sea life of Cozumel. Riding your underwater scooter with your head dry in the air filled helmet, you can drive around the reefs. Especially great for people who wear glasses as you can have them on under water. Beach lounging — most of the calm western side of Cozumel has rough rocky beaches not suitable for swimming or sun bathing. The areas that are suitable have been turned into small parks. Some charge entrance fees which includes a beach chair and umbrella as well as access to the washroom and shower facilities; others are free to use, and offer many of the same amenities, while relying on visitors to purchase food or drinks. Playa San Francisco is located 20 minutes by taxi south of town and has a restaurant on site. The "Other Side" — the beaches on the east (windward) side of the island. Sandy surf and large waves alternating with rocky limestone coastlines on the east side of the island are beautiful but can be dangerous for swimmers. The roaring surf creates strong breakers and undertows in many areas. Never enter the water alone. There are now many areas where flags are displayed showing the level of safety for a particular area. Despite the potentially dangerous swimming conditions, these beaches are stunning and serene for enjoying sunbathing, long walks or playing in the water very close to shore. These beaches are popular with surfers and kite surfers, and with locals on the weekends. Silver is cheaper here than in the U.S. but be sure to look for the .925 stamp as some places do sell fake silver jewelry. Local restaurants, most fairly good and fairly similar to each other, are plentiful in and around the city's "downtown" main square. La Choza, Calle Adolfo Rosado Salas #198, at Avenue 10. Phone: 987-872-0958 http://lachozacozumel.com/ Great homestyle, local Mexican food served in a relaxed atmosphere. Fish is excellent, tasty fajitas and guacamole. Only one Margarita needed here! El Morrito III, 6th Street North between Rafael E. Melgar Avenue and 5a North Avenue. This tiny restaurant is located in a Mexican home off the beaten path. If offers cheap (cheap for Cozumel, although expensive compared to the rest of Mexico) authentic Mexican food. Tacos are ok (again, not as good as other places in Mexico), and cost about $1.25 apiece. The atmosphere is unbeatable though! Pepe's Grill, At the corner of Avenida Megler and C Salas, Steak and Seafood. Prima Trattoria, Adolfo Rosado Salas between Avenidas 5 and 10. Northern Italian style cuisine offered along with wonderful salads ~ try the blue cheese salad! Excellent pasta and seafood, they know how to prepare it properly and it’s super super fresh. Try the surf and turf for a mix or the seafood linguine combo, both will suit you! Senor Frogs, , Located right above Carlos 'n Charlies, Senor Frogs is a hotspot for young people and tourists. A very laid back atmosphere with very few rules. There is a bar incorporated with tire swings; just to have fun while you drink. Also, they have a dance floor and a stage for the live music they sometimes provide. If there is not a band, there is always a DJ to keep the party going. Prices vary depending on the drink. Downtown, bottled liquor prices seldom vary, though you'll find some drop-off the farther you get from the center of the city. Don Julio Tequila runs $45-50 at the tourist shops, but if you have time find a local grocery and get it at half price. Kahlua runs $10. Bars seldom monitor customers for age or drunkenness, so take care driving or walking as the evening wears on. This page was last edited on 15 April 2019, at 15:40.